Just Say no! No Chipotle These are not so good for you ! The above picture of a Smoked Jalapeño, often referred to as a ‘chipotle’, was a perfectly good Jalapeño. After being heated and dried it looses most of its original appeal, as well as almost all of its nutritional value. What was once a beautiful, beneficial, healthy, tasty, and flavorful veggie has become a ghost of itself. The Jalapeño, one of the top ten healthiest foods available, has now been destroyed. Sure it can be re-constituted and salvaged, but it will never regain its dietary or nutritional values. About twenty years ago the ‘Chipotle’ became a common household word, and recently an entire market has sprung up surrounding its mystique. Surprisingly, the chipotle has made it into many traditional recipes. And for good reason! It has a very unique taste which adds a rainbow of flavors to your favorite dishes. Good For You! These are happy healthy Smoked Jalapeños! 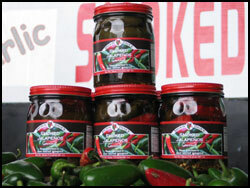 Until now it has been the only “Smoked Jalapeño;” available to you, In the World ! But no longer do you have to use dried up, nutrition less, leathery, crunchy, or powdered veggies in your recipes. No longer do you have to go to these extremes for great flavor and nutrition. Now “Smokin’ Daves” offer you truly “Smoked Jalapeños.” They still look like Jalapeños, and still have all the nutritional value, with one thing added – even a larger rainbow of flavor. A winner of many awards, there simply is no comparison. Sure the raisin was a great idea (for backpackers) but wine – even better! © 2007-2019 FirenSpice.com. All Rights Reserved.